What’s The Worst Thing You Can Do In A College Dorm? At my college orientation (somewhere between a long time ago and not a long time ago), one of the incredibly few things I remember is the safety presentation by the campus police – to their credit. It was really boring, but I do remember it, which is a few strokes above par as far as college goes. 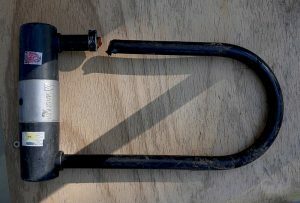 U-lock severed with bolt cutter. Besides the warning that nobody will say anything if they see someone use bolt cutters to cut the lock off your bike and take it, the other recollection I can vaguely conjure up is this: “Please, for the love of all that is holy in the world, do not throw anything out your window.” They didn’t say that exactly, but it was what I heard. This is common sense. For example, shooting crushed cans out a dorm window with a hockey stick, which I can attest is great fun, would have been a huge no-go. 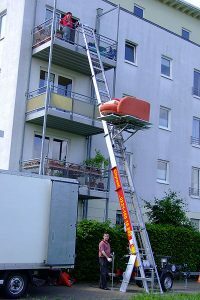 Certainly, it would be absurd to think that a person should ever climb out onto the roof, though in case you didn’t know, it’s possible. And disposing of stale beer by pouring it into the bushes is right out, even though it usually will not hit anyone, if you aim well. At the time, it seemed to me that trash was probably the reasoning behind the rule. Surely, college students must make a habit of ditching garbage off rooftops like Romans ditching the contents of their chamber pots. New Orleans Lower 9th Ward, “Holy Cross” section. However, as with every stupid rule, there is a stupid logic to this window-related ban, and an equally stupid story of the time that somebody screwed it up for everyone else, necessitating a particularly stupid new rule. 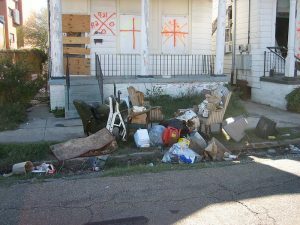 Trash thrown out windows is a fact of life, the chief of police explained, but it’s no epidemic, and it’s not the inspiration for the window policy. The real culprit? Furniture. We were told that the college has a huge problem with students deciding to ditch furniture out their windows at the end of the year. This action, I learned, is known as defenestration, and it’s apparently the number one thing my college wanted us to avoid. I was surprised to hear that the college doesn’t simply leave the furniture on the sidewalk; someone has to come pick it up. This might explain why I never noticed pieces of broken shelving sitting in the street. But is defenestration all bad? Beyond the logistics of fitting a sofa out a window, the problem of how to pretend that it was actually your neighbor who threw his credenza to the ground, and the issue of whether a chaise longue can fall several stories without scraping the side of the building or smashing windows beneath, the question remains: what’s so wrong with defenestration that we need to besmirch the reputation of this obscure practice? In light of the grave warning that I received from our boys in blue, I decided to launch a full investigation into the pros and cons of defenestration. Digging into the past, I was shocked to find that the history of defenestration is blood-soaked from the very first moment. What follows, I hope, will be a balanced discussion of the issue, so that you, my audience, can make up your own minds as to whether you dare throw things out of windows in the future. Coming into this investigation, I was mostly only familiar with the leisurely side of throwing things out the window. Little did I know that the origins of the practice themselves actually date back to murder. If you consider how old windows are, compared to how old murder is, this should come as little surprise. The surprise, actually, might be that it seemingly took until 1419 for somebody to combine the two. In this case, it was in Czechoslovakia. Illustration by Roque Gameiro, in Leonor Telles (by Marcelino Mesquita, 1904), showing the people of Lisbon killing the Bishop D. Martinho de Zamora during the 1383–1385 Portuguese interregnum. Though the Czech people, like the citizens of most nations, have a long and storied history of murdering people, we will be directing our focus specifically to the years 1419 and 1618, when Czechs in Bohemia, for lack of more precise terminology, murdered a few people and invented defenestration. I know this is a morbid topic, so I’d like to start with some good news: I was heartened to read that, despite the controversy, only around seven people were murdered during the process of inventing defenestration. In 1419, the victims were a Catholic judge, a magistrate, and at least five Prague town councillors, who hit the pavement and died on impact. The murders apparently hyped up the Czech Hussites, who started a civil war to successfully weaken Catholic influence in Bohemia. 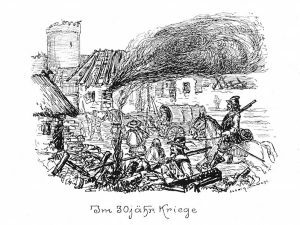 It isn’t clear why the Hussites were angrier about the defenestration than the Catholics; it could be because several of the Catholics were newly dead, which makes it hard to stay angry. Soldiers in the Thirty Years War at the castle of Plau am See by Ludwig Düwahl. In retrospect, it seems that the Czechs viewed the first war as a sort of test run, because they repeated the act two hundred years later on two Catholic regents and their secretary, all three of whom survived. This attack caused a hullabaloo so massive that it was necessary to invent a term for it: defenestration. Now, it’s unclear whether the men’s survival was due to worsened defenestration techniques in the intervening two centuries, or improved window safety standards; it depends on your perspective. A fun fact is that the Catholic account of the Second Defenestration attributes the men’s survival to divine intervention, whereas the Protestant account attributes it to a particularly soft dung pile in the street. Taking into account the seven deaths in 1419 and the three survivors in 1618, I can completely scientifically conclude that you have a 30% chance of surviving being thrown from a window in Prague. Part of stained glass windows in Kutna Hora, St Barbara’s cathedral. Here’s the twist, though: the completely non-fatal Second Defenestration actually kicked off a much larger war, the Thirty Years’ War, which (according to the Google search that I’m doing right now) was apparently the deadliest religious war in European history. 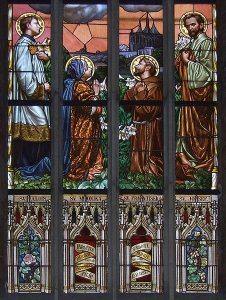 If fighting a religious war over a window seems excessive to you, consider how seriously the Catholic Church takes stained glass. So, despite the apparently significant survival rate, it’s impossible to call defenestration a safe activity. My research indicates that in two out of two cases that I assessed, famous defenestrations have caused full-blown civil wars. Those wars killed a combined three to ten million people, qualifying defenestration as a “highly dangerous activity,” according to a scale that I’m making up off the top of my head. Therefore, I can fully confirm the findings of the campus police at my alma mater: defenestration is bad. The list of things you shouldn’t defenestrate is so long that if you wrote it and then defenestrated it, it might stretch all the way to the ground, depending on the height of the window and the size of your handwriting, among other factors. There is simply no safe way to throw things out your window, and somebody is going to eventually have to come clean up the path of destruction that you’ve left in your wake, so please, keep your hands, feet, and loveseats inside the building at all times – for everyone’s sake. 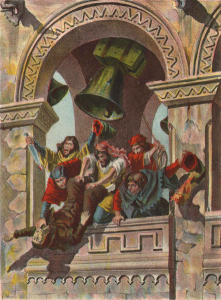 (Featured Image: The Defenestration of Prague (Original Macmillan Poster) (Print) by Macmillan education posters. Ref: 20thWindowLL, The Illustration Art Gallery).